Organise a fantastic treasure hunt with our amazing Pirate Adventure on the 7 Seas! The kids are sent on a swashbuckling journey in pursuit of the hidden treasure. With the help of various clues, they sail from destination to destination where they must solve pirate puzzles and complete exciting challenges to find out where the treasure lies! The treasure hunt begins with the little pirates getting a log book for their ship. Their first task is to come up with a name for their pirate ship and design their flag. Then they receive clues leading to nine destinations where they encounter brain-teasing puzzles that need to be solved and challenges that must be completed. After each completed assignment, they get a pirate card to stick into their log book. Everything you need to organise the treasure hunt is included in the package, with the exception of a few simple props. The log book, puzzle and challenge descriptions, necessary cards and instructions needed to play the game are all ready for use. There is even an invitation to the party and a diploma for each little pirate. The treasure hunt can be set up inside or outside, or both! 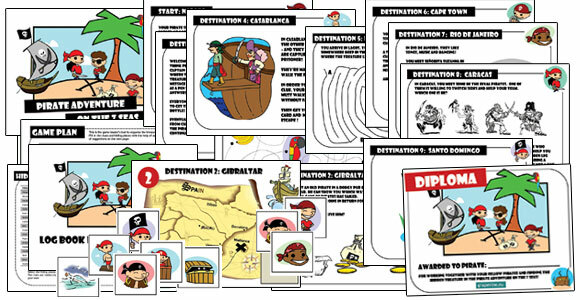 With the help of the easy-to-follow structure, step-by-step guide and a game plan for the game leader to use, it takes no longer than half an hour to prepare - and your pirate party will be a huge success! You can organise the treasure hunt for small or large groups or simply divide the kids into teams. Suggestions and tips on how to set up the game are included in the guide. The Pirate Adventure is played as a team, without being competitive and works well at both smaller celebrations and big parties. If you have a big gang of little pirates, it works well to divide them up into several teams. The duration of the game is approximately 40-60 minutes.